Little Bit & Big Byte Go Green by Craig T. Feigh is a delightful children’s book that combines computer-themed characters with the goal of teaching children to care for the world around them. Meet Little Bit Romie and his family: Dad, CD; Mom, Nettie; little sister, Joy; big brother, Big Byte; dog, Click; and cat, Browser. It’s Save the Environment week at school, and the family learns the little ways that each of them can contribute in the effort. But when Click goes missing, Little Bit and Big Byte hop on their bikes and track him down! They also track down what happens to the trash they’ve been recycling and learn just how much recycling can do for our families, communities, and the world! Are you looking for a fun way to teach your children to help save our environment? Little Bit & Big Byte Go Green is an entertaining and memorable way to do so! 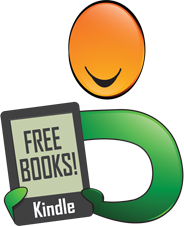 Craig T. Feigh has created an engaging little book that combines environment-saving strategies that kids can do with delightful characters that kids will remember. The illustrations by Patrick Carlson are appealing and made me want to examine each page to make sure I haven’t missed anything. There’s so much to look for. Keep an eye on that caterpillar. He’s great! Children often feel like they can’t change anything in a grown-up world. 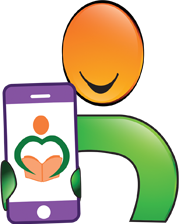 I love how Little Bit & Big Byte Go Green gives children lots of ideas for ways that they can make a difference. Little Bit & Big Byte Go Green is a children’s educational picture book written by Craig T. Feigh and illustrated by Patrick Carlson. Going green is fun, saves the environment and is really quite easy once you’ve discovered what you can do to be green. In this tech-centric story, Little Bit Romie and his family show what they’re doing to participate in their school’s Save the Environment Week. Green is already Little Bit and Big Byte’s favorite color, so going green is even more fun for them. Simply shutting off the faucet while you’re brushing your teeth saves a lot of water, and an energy efficient night light uses a lot less energy than the lamp on your nightstand. From recycling paper, tins and glass to using mass transit, Feigh’s entertaining book shows kids how they can go green. 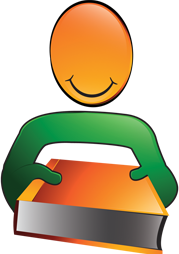 There’s a challenge to find the hidden recycle logo in each panel, and Little Bit and Big Byte share their own ways to go green. The author also includes a line drawing of Little Bit and his family for young readers to color in. Craig T. Feigh’s educational picture book for children, Little Bit & Big Byte Go Green, will have tech-savvy kids chortling over the techie jokes sprinkled throughout this book, and get just about everyone feeling enthusiastic and motivated to do their part in going green. This bright and lively story is perfectly accompanied by illustrator Patrick Carlson’s marvelous cartoon images. Each picture is loaded with details to pore over, and some of those hidden symbols will take quite a bit of detective work to find. 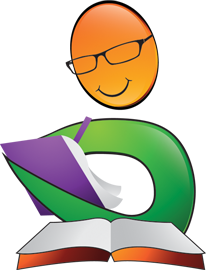 This light-hearted approach to a serious subject is just what’s needed to get kids informed and taking part. Little Bit & Big Byte Go Green is most highly recommended. 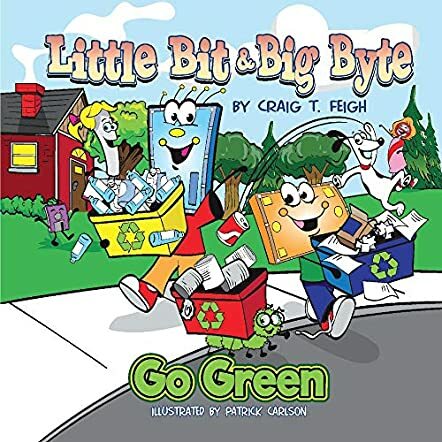 Little Bit & Big Byte Go Green by Craig T. Feigh is a 34-page children’s picture book that talks about pollution, conserving energy, reusing and recycling what we use. It introduces several characters: Joy, CD, Nettie, Click, Little Bit and Big Byte, and Browser in bright, color-filled animation. There are ten suggestions on how to go beyond the simple “turn off the light switch when you are done with the room” so that kids can keep thinking about how they can make things better. It also includes a page they can color. This book is not unique by any means. In the 1970s I grew up learning about pollution and waste and ways we can all help the earth, just like it is presented here. However, what this book gives is an updated, relevant version of the problems we still have, but in a positive, light-hearted way and one which kids can easily identify with. The book provides a few examples of how some of the characters don’t use the best choices at first, but then the story goes on to tell the young reader how that choice can change into something much more positive. The message of Little Bit & Big Byte Go Green by Craig T. Feigh is one that needs to be learned by every generation, and teaching kids young is a great way to help them make wise decisions for their own future. I also think that parental involvement is paramount here. If you lead the way, the kids will follow. This book is highly recommended.